In the winter of 1990 I bought a round-the-world ticket from Pan Express in New York. The total cost was $1500 and the travel agency’s gaunt boss helped to arrange the path of my six-month circumnavigation of the globe. “I think so.” The route was popular with the backpackers according to the Rough Guide to the Far East, the bible of the Orient. Two weeks later I took off from JFK, stopping for a two week in Biak before heading to Bali, where I sat writing a novel about a conman from New York forced into a Vegas hit only to fake the murder and escape into Death Valley with two feminist filming a movie about the last man on Earth. Hippie travelers in Ubud wondered why I wasn’t writing the novel in California. “You need a car in LA and I stopped there on the way out to take photos.” These pictures of Hollywood and Death Valley were pinned against the wall of my bungalow along with a score of postcards from Southern California. I gazed at them while writing on a Brother word processor, which was lighter than a typewriter. I was a man between worlds, sometimes in the West and sometimes in the East. During the day I wrote alone, listening to music on my Sony WorldBand radio. In the afternoon I rode a 125cc motorcycle around the island. Volcanoes towered over the terraced rice paddies, Temples abounded throughout the villages, and wild surf rose from the ocean to pound black sand beaches. At night I drank beer with Balinese musicians and female travelers. They were all in their 20s. I was reaching at the end of my 30s. My drinking friends made me feel young. Every morning I wrote with dyslexic fingers to create chains of typos and my syntax wandered through tenses like a drunken time machine, but each day I completed 4-5 pages and I counted about thirty pages at each week’s end. After two months I had two hundred pages covered with corrections. The local copy shop printed out a thick sheaf of paper, which I posted to my apartment in the East Village and planned my departure to Java, the next island on my route. On my last night in Ubud I held a Selamat Jalan party at the Cafe Bali. Arak and beer flowed down our throats. The Balinese boys made me swear to return next year. “Saya jah kembali.” It was easy to say ‘I’d be back’ in Bahasa Indonesian. The next day I traveled by taxi to the port of Gilimanuk. The ferry left on time. A young girl threw a chicken over the side. The bird flapped its wings on the descent to the waters of the narrow strait. It seemed like a cruel thing to do, but I remembered reading many small stories in the NY Times about sunken Indonesian ferries and thanked the chicken for its sacrifice. Ketapang on the other side of the narrow strait had a different feel than Bali. Eating or drinking during daylight hours was considered an offense. That afternoon I traveled with other westerners to Mount Bromo, an active volcano looming over the fertile landscape. Next stop was the magical city of Yogajakarta. I toured the palace, bought batik, and waited till sunset to break the Ramadan fast. Outside that royal city was the sprawling stone monument of Borobudur, a reminder of Buddhism’s epic era pre-dating Java’s conversion to Islam. I rented a motorcycle and rode with an Aussie couple to the blackened pyramid surrounded by a low escarpment dominated by Mount Merapa. At the top of the ruins I started to put a stick of gum in my mouth. Several Indonesian men frowned at this and I put it back in my pocket. “I’m starving.” The Aussie couple didn’t care about local customs. “None of the warungs are open.” Every food stand was shuttered for the day. “There has to be someplace to eat.” Jim was a good fella. We were planning to climb the mountains to the Dieng Plateau. “And maybe beer.” Jim liked beer. “That’s right.” I liked beer too. We set out of the bikes. The road climbed to the small town. A Chinese restaurant was serving food. The owner peeked out the door to make sure the Indonesians weren’t spying on him. He served us cold noodles. “Amok must be the same as the Vikings going berserk.” Jim’s eyes widened with expectation of a show. “I have no interest in witnessing a crazed berserker attack here.” Jim and his wife were on holiday. “I bet no women go amok.” Jim’s wife had no time for machoism. Jim and I exchanged a glance and dropped the subject. We ate the cold food and drank warm beer, tipping the warung owner generously before continuing on our way to the plateau known in ancient times as the abode of the gods. Pine trees graced the slopes and the air cooled, as we skirted the volcanoes. The sun scorched my skin and I put on a long shirt. Prescription sunglasses shielded my eyes from the glare at almost 6000 feet above sea level at the equator. 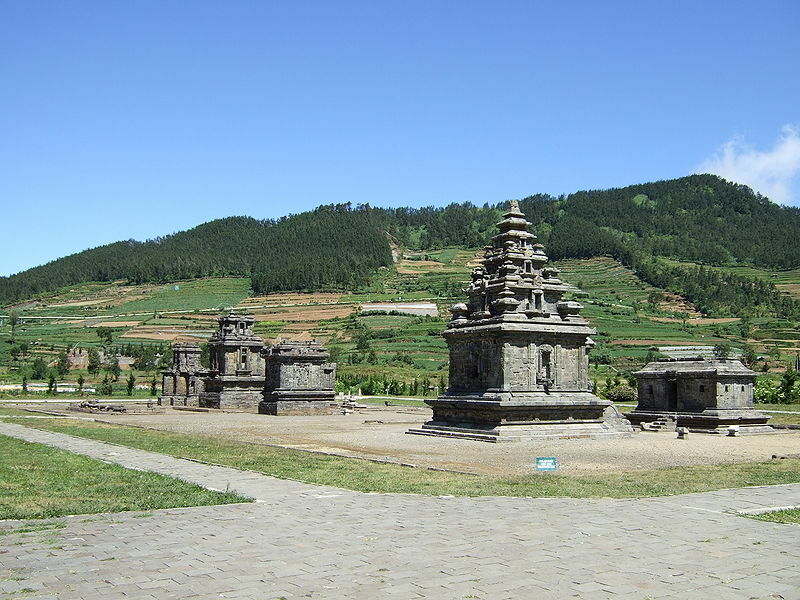 The Dieng Plateau was as high as the summit Mount Washington, the tallest peak in my native New England. We traversed the pass between the steep cones of Gunungs Suming and Sindoro. To the south lay thousands of miles of the Indian Ocean and the sharper blue of the Java Sea marked the northern horizon. Vertigo assailed my senses, as if I were traipsing the tightrope of an equatorial faultline. Jim and his wife were also overwhelmed by the massive loss of perspective. We stopped at a small Hindu temple. The shrine to Shiva wasn’t impressive, but dated back to the time of the Maya. “Once hundreds of these complex were here.” I had read that in ROUGH GUIDE as well as how the monuments were cosmic mountains. Sulphur seeped from the ground. My feet felt the warmth from the volcanoes underneath us. We drove around the plateau, stopping to take photos. There were no restaurants and the only village was shut for Ramadan. Jim checked his watch. The three of us set out down from the Dieng Plateau. The Koran said nothing about feeding our motorcycles and we filled the tanks of our motorcycles. Jim rode faster than I liked, but I kept up with him through Bulu, Termanggung, Secang, and Magelang. The sun dropped in the west on the outskirts of Tempei. I followed Jim’s taillight for miles and didn’t think anything, when he turned onto a smaller road. I got concerned, as the road, became a trail. I beeped my horn. Jim didn’t stop. I couldn’t see anything through my sunglasses. Darkness was complete without any moon in the night sky. The path ended in a tiny village and I braked behind what I thought was Jim’s bike. The driver got off the motorcycle and confronted me with a kris. The wicked curved knife waved inches from my face. The wielder was Javanese. He shouted with wild eyes glowing with the light of the nearest kerosene. I was facing a man amok. Other men gathered around him. They gaped at me. I was the first westerner to come to their village since the departure of the Dutch in 1949. “Pelan-pelan.” I wanted him to calm down. The kris was a deadly knife. I couldn’t think of the word for lost, but somewhere on the road I had followed him, instead of Jim. I pulled out my map and showed it to him. He laughed upon hearing that I was lost. The knife returned to his waist. “Sama sama saya.” Everyone was hungry this time of day during Ramadan. Especially if you were lost and I bowed gracefully and joined the farmer for their breaking of the Ramadan fast. I wasn’t driving any farther with sunglasses at night and join them. The iftar was good eating and I slept outside with a million stars swirling in the deep darkness of eternity. The next morning I showed up at the hotel. “Where were you?” asked Jim’s wife, clearly worried that I had drivne off the road. “And now you’re found.” His wife poured some beer. Our small hotel was a sanctuary of infidels. “For now.” The beer tasted good cold. Then again cold beer always tasted good during Ramadan. This entry was written by Peter, posted on January 29, 2018 at 10:01 am, filed under 90s, indonesia, semi-fiction, Travel and tagged amok, dieng plateau, java, ramadan. Bookmark the permalink. Follow any comments here with the RSS feed for this post. Post a comment or leave a trackback: Trackback URL.